It is a super gloomy day in Tacoma. The rain is beating down hard and it’s got me thinking about spring. Once I was thinking about spring, I was thinking about gardening and how, oh right, I have a garden blog! So I’ve gone six months without a post, what else is new? I think I may start blogging again. I don’t think many people even read it, due to my complete lack of consistency, so maybe I should just start babbling and working on my craft for fun. A lot has happened in the past six months. In my last post, I told you about my dog, Max. Sadly, we had to say goodbye to Max in early October. He got very sick and it was one of the hardest things I have gone through. I guess I am glad that we knew to expect it after his cancer diagnosis last spring. It was sort of a long goodbye. I am grateful that I was able to spend the summer with him and that he got do to what he loved best, lay on the patio in the warm sun, with a smile on his face. Max was almost 12 years old and had a wonderful life. It’s an amazing thing to consider all that he witnessed on his journey with Adam and me. He was around through medical school, the birth of Gavin, a cross country move to upstate NY, the birth of Olivia, another cross country move back to the Pacific Northwest, a rental house, and then our final move to our home in Tacoma. Max was a funny dog. He was scared of just about everything, yet I remember how happy he seemed when we moved into this house. He loved the patio and the gardens. I remember thinking that he finally felt at home, like “Yep, this will do!” He led a very simple life and enjoyed nothing more than a comfy spot to sleep. I miss him. In September, the kids went back to school. Gavin started third grade and our little Olivia started kindergarten. Both kids are now in full-time school. It’s such a cliche to constantly talk about how fast time flies but it’s remarkable each time a milestone passes. How is my littlest baby in kindergarten? I saw a guy at the grocery store this morning, getting his little toddler out of the car and carrying her in his arms to the carts. A part of me ached because I swear I was just doing that with Olivia. Now I go to the store while she and her brother are in school. (That is actually pretty heavenly, if I’m being honest!) Anyhow, the kids are growing up and have little lives of their own. I love that. It’s so fun to hear about their days and listen to them giggle about school stuff. Liv marched right into school and never looked back. She has a wonderful sense of pride. Gavin has two and a half years left of elementary school. That actually makes my heart skip a beat. I swear that he was just in kindergarten himself! Now he’s doing long division and reading chapter books. He has such a passion for sports. If you ask him about his day, he’ll likely tell you a story about a sweet interception he made at recess. He has a joyful demeanor. I hope he always possesses such an enthusiasm for life. It’s contagious. So with both kids at school and saying goodbye to Max, our home became incredibly quiet during the day. We started talking about when we’d get another dog. We figured the spring would be a good time to bring home a puppy. Then my mom told me that her boss was getting a golden retriever puppy in January and that there were litter mates available. January is a great time to bring home a puppy, right? Who would say no to housebreaking in the rain? We sure wouldn’t! I must be insane! On January 1st, we made a trip down to Oregon to bring home our new puppy. 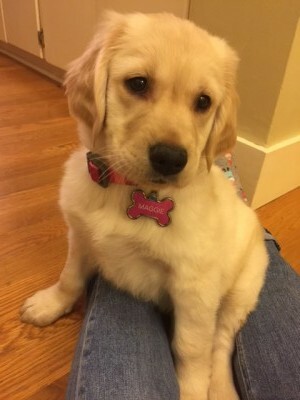 Her name is Maggie and she is just about 11 weeks old now. Did you know that puppies are a lot of work? Wow, had I forgotten! This month has been a blur, almost feels like having a newborn baby in the house again! We’ve had some rough moments but for the most part, she’s a good girl. She is very loving and makes me think of Max quite often. I think they would have been fast friends. It’s fun to see the kids bond with Maggie and think of all the adventures they’ll share. I’m happy to have a pal around during the day to keep me company. She’s currently laying on my feet while I type. There really isn’t anything like the love of a dog. New beginnings… Much has changed and much is the same. We’re plugging away through winter and I’m starting to think about my gardening endeavors. This will be the third summer in our new home and I’ve changed nearly all the gardens since moving in. I’m very excited for this coming spring and summer to see how my new plants mature. We did a bunch of fun things over the summer and I’ll eventually get to writing about them and sharing photos. I’ll start getting busy with the school garden soon and have been brainstorming ideas for new activities. I’m also going to start working in the Master Gardener Office Clinic this spring. I’m looking forward to broadening my scope of knowledge by helping those in the community solve their gardening problems. Should be a good 2016! 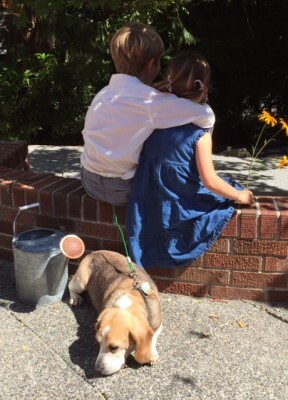 Kids with Max, inspired by Norman Rockwell. 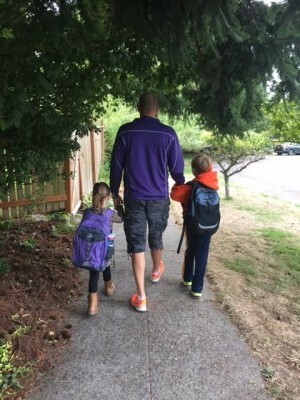 Dad walking kids on the first day of school. 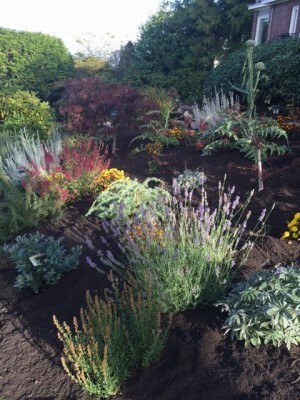 My garden in the fall. Can’t wait to see her return in all her glory. Absolutely beautiful. You’re quite the wordsmith, despite taking a six month hiatus. Now I’m hungry for spring and missing our little Max. I read this. 🙂 Cuz I too have neglected my blog which in my case means I am neglecting my crafting. Yearning to get back to it. A gloomy rainy day is perfect. ?? 🙂 Minus my piles of laundry I am doing first. Great recap on our life!! That’s supposed to say YOUR life. You’re a beautiful writer, Jen. Love your posts. Can’t wait to meet Maggie!